I love when I come across a simple product that makes my life easier. I first saw this product at CHA back in January. To be honest, this was one of the clever products I saw at the show and I knew I needed one for my craft table. 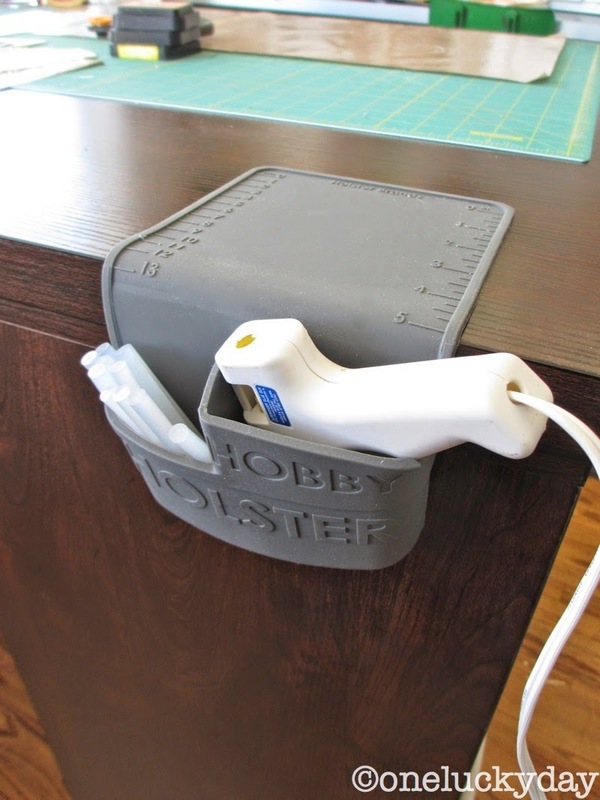 The Hobby Holster is a heat resistant, silicone pocket that holds your glue gun (even when it is plugged in). It is made of 100% silicone and has a divided pocket for holding the glue gun and glue sticks. No holes or hooks to keep it in place, just a flap that grips to the counter top. That means if I'm working on something at the kitchen table instead of the craft room, I can pull it up and take it with me. genius. I find it so much easier to have the glue gun in the pocket instead of the desk top, since every single time, the glue gun falls over and I inevitably get glue on something that I shouldn't. The flap that sticks to the table top even has a handy measuring guide. The Hobby Holster comes in 4 colors, pink, green, turquoise, and grey. The nice people at Hobby Holster have provided me with a turquoise Holster to give away! So if you might be interested in having your own Hobby Holster, just leave me a comment to win. I will pick the winner on Thursday morning, July 3rd. Seriously, what crafter doesn't need one of these? Hobby Holster is also offering One Lucky Day readers a 25% discount the entire month of July. See you back here on Thursday with a winner and a new tutorial. It is awesome! And it would match my room! I have a friend who would love this! Thanks for the chance to win. I definitely need one of these. I'm fed up with my glue gun falling on the floor and sticking to the carpet! Thanks for the chance to win. This is an Awesome product!! I'm thinking...how about the Ranger heat it craft tool ??? Mine is always down by my feet and I worry about it being too warm when I put it down there so I'm always trying to prop one end up...this would be SO much more convenient! Oh wow! Definitely need this incredibly innovative invention! I definitely need one - thanks for sharing! Oh my Gosh! How clever! Definitely need one of those. What a great idea,anything that saves you or your work table getting burnt is brilliant! Genius! I love it when some new comes out, especially in pink (and turquoise!). Hope your summer is going good. Waiting for the monsoons here in AZ. It is genius! I have an old wooden holder that inevitably tips over and I either burn myself righting it or get glue where it isn't wanted. Love new innovations that work and make crafting go smoother. Great invention! A safe way to hold the glue gun. Thank you for the chance. definitely need one of these. I'm fed up with my glue gun falling on the floor and sticking to the carpet! this will be A safe way to hold the glue gun, or anything like this. Love new innovations that work and make crafting comfortable. I'm fed up with my glue gun falling on the floor and sticking to the carpet! Thanks for the chance to win. Oh yes, I sure do want one! This is a great idea! Thanks for the giveaway. BTW, any leftovers from your class? Fingers crossed! Oh, wow! I'm excited about this product, and the freebie is my favorite color. Thank you so much for sharing. If I don't win, I'll certainly have to find one! Great product and in my favorite color. Crossing my fingers! I love to have one of these! I'd use it for my hand sewing supplies beside my recliner. I love a good notion and this is definitely a great notion! Wow, looks like a brilliant piece of equipment, I'm forever dropping my glue gun and getting stuff where it isn't wanted. I bet these won't be available in the UK, so thanks so much for giving us the chance to win one of these!! What an awesome product, no more trying to peel glue off the craft table! Thanks for the chance to win one! This product will make crafting a lot nicer and cleaner. Thank you for a chance to win. OOOOHHHHH!! That is exactly what I need and turquoise will perfectly match my room! Thanks for the fun giveaway! What a great idea. Would love to win one. Thanks for the opportunity. Omg! That's the cutest idea! What a cool (or should I say a hot idea!)! Thanks for a chance to win one. How CLEVER!!! Silicone is an amazing product! So glad you found this item & thank you for offering one as a give-away, Paula! A turquoise Hobby Holster would be a perfect addition to my studio. What a great idea! I might need two of them..another for my small hot iron for fusing. What a fabulous idea...........must have been a woman who thought of that! Awesome product. I think I saw it on Shark Tank and thought then it was just perfect for artists and crafters. What a great idea!! I would love one of those! Shut the front door!! That's just awesome and I would love to win one. What a great idea. Going to have to check into getting one. What an awesome idea! Thanks for the heads up! WOW....would love to have this in my scrap room; thanks for the chance to win! This is a wonderful idea! I would certainly love to have one! How generous to give one away! Awesome! I would love the chance to win. Thankyou so much for the opportunity. Thx for the chance on winning one of them. Good luck to everyone! ME ME ME!!! LOL! What a cool invention, just brill! My heat tool always falls into my trash. I so need one of these! Thanks for the chance to win! Cool post! Great idea, I would so love to win this. Thanks for the chance. What a fantastic product, it would really be helpful. Thanks for the information and a chance to win! Oh my goodness, I love this. I have often needed a spot for my glue gun or heat gun and this is perfect. I would love to win this. This just rocks! Can't wait to try it out! Oh, Oh! Pick me! :o) What a great idea, I totally NEED one of those! how fab is this. I can't wait to get one. i am always tipping mine over. Looks like a great product. I'd love to win one! Thanks for the chance. I was just getting irritated with my glue gun yesterday as it kept tipping over on my craft table. I was thinking about sticking it in a clay flowerpot (a tip I saw on Pinterest) but didn't have one handy. The Hobby Holster is THE PERFECT solution. I would love to win this! what a great idea!! glue guns are so useful yet so unstable LOL Thanks for a chance to win this great crafting tool! I really hope I win. This is just what I was looking for. How COOL is that! I would love to win one!! Thanks to you and Hobby Holster for the chance to do so! Genius, absolutely genius idea! Would love to have one! Thanks so much for sharing info about it! That is totally ingenious! I'd love to win one! This is a fabulous! I am always knocking my heat gun over. I was reading every bit of this posting hoping you would mention where to buy one. When I saw you were giving one away I actually did a little dance. My glue sticks are always on the other side of the room when I need them and I always drop the first one, so it gets lost in the craft abyss. 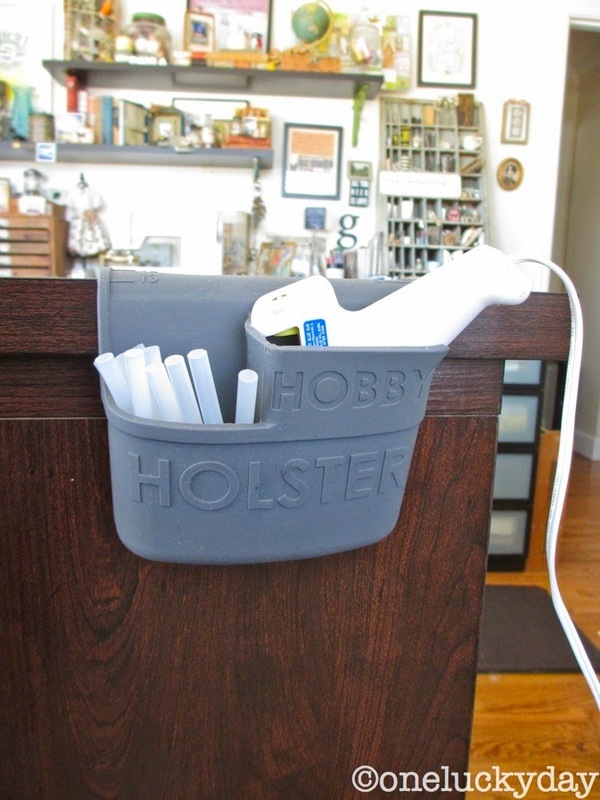 This holster would be perfect( and no more glue stuck all over my filing cabinet where I hang it up)! I need so much one of these for my heat gun, the idea is brilliant and simple, thanks for sharing. What a simple product that will make us happy. How great is that? What a wonderful find that would be. Thanks for always improving our technique, tools and talent! Next round of gifts to my scrap queens will include one of these. Would love to own one myself! Wow, what a fab invention for the craft world folks! This little baby would be a joy to own. Thanks for sharing and the opportunity to win! What a great contraption ! I need this to keep things under control! Thanks for showing it to us. That is the coolest thing ever!! I hate how my gun always tips over and takes up work space. Wow , how handy is that !! I love it ! Thanks for the chance ! Wow ! Super this tool !!! I need it !!!! Thanks for the give away. That's a great little item. I'd love to own one. Thanks for a chance to win...great product!
. Would love to have one! What a great idea - that would sure come in handy! Thanks for the chance to win!! How clever is that? I too keep getting glue all over the place or am looking for glue sticks that roll somewhere on my craft table when I'm working. Very cool tool. As I was reading your post, I was thinking, I definitely need one of these in turquoise! Ooh, would love to win this fab invention. Thanks for the giveaway, Paula! How 'cool' is this?!? Love this handy carrier and would love to own one; thanks so much for the chance! Since Turquoise is my birthstone (Dec) I would LOVE to win this! Thanks for the chance. Wow what a great idea. I would love to win !!!! Great idea! I need this! My cat is always knocking the g gun off of my table! Awesome idea - I might actually USE my glue gun more if I had this! Love the color.... Thanks for a chance to win one, and always thanks for your inspiration. What a GREAT product. I don't use my glue gun all the time because it falls and I seam to get glue everywhere I don't want. The Hobby Holster would stop that and I think I'd use my glue gun more. I love this and I need this....thanks Paula! That is SOOOO smart! I can't believe all the things people are coming up with to make crafting even more fun and easy! Where has this been all my life?!?! I cant wait to get my glue gun holstered! Thank you for the opportunity to get one. OMG finally something to put glue gun in that doesn't tumble over or burn thru something!!! Genius and so nice of them to give us a discount for July...yeah!!! Thanks for sharing! How ingenious! Definitely a "Must Have" now that I am using my GG more and more. Winning one would be even better. Yes, yes, yes. Love it and don't know why someone hasn't come up with this before. I would have picked turquoise so hope my comment wins the raffle. Thanks for the chance to win. This is going to go at the TOP of my gotta have it list. Such a fabulous product! Thanks for the chance to win. How cool is that?! I hadn't seen this before but I love it! Now, how cool is this - literally. I fear my hot glue gun and rarely use it because it is always attacking innocent things like me, my carpet, other things on my table. What a great soulution. Would really put this to use. Thanks for sharing. Oh my that is cool! I would absolutely see a need for that in my future (lol) - Thanks for the chance to win one instead. This is an amazing and handy "tool" to have!! I never have room for my hot glue gun on my table so this is perfect!! Thnx for a chance to win one!! What a clever idea in a small package! Would love to win a turquoise one! Yes! My glue gun always attacked me whenever it fell off the table. Thank you to the inventor! Thank you, Paula for sharing. I would love to win the Hobby Holster. What a great safe way to hold the hot glue gun and make space on the craft table. What a great invention!!! Would love to win one, thank you and the company for a chance. If I don't win, taking advantage of the coupon and ordering one. OMG... maybe I can be burn/blister free going foward. HA. Who am I kidding?? I'm a walking accident around a glue gun, but maybe it will be less! Love the colors too! OMG what an awesome tool. Would be so much cleaner on the workstation. That is such a brilliant idea! You see things like that & wonder why someone hadn't come up with it before... As always, thank you so much for your blog inspirations and the wonderful chance to win such a great tool! We all need one of these! Very clever! This would be so useful in freeing up valuable space on my desk. LOVE that idea! Turquoise is also brilliant choice! LOL - thanks for sharing. This is an awesome idea! Sign me up! OK, this is cool. Thanks for the chance! Omg this is genius. Love it and would love to win it. I agree. Who wouldn't want this. I know I would love to have one. Thanks for the chance to win one. This is brilliant! I so need this. I've got a hot glue gun burn on my leg from years ago. I wish this product had been around in those days! Brilliant idea. I need this in my craft area. person whether it is paper art or fashion. Keeping my fingers crossed! I wonder what took so long for the invention of this handy dandy tool! Great invention, no more tripping over the cord, (well maybe) or having to reach over and put it in the enamel pan I keep my in now. what a fabulous idea !!!!!!!!!!!!!! Man I need this it is the coolest helper ever I was just trying to figure out how to keep my glue gun and stuff out but not in the way! Oh count me in! I would love one of these I always have a battle with my hot glue gun, and I usually lose and come out with burns! It always falls over this is awesome! Thanks for the chance to win! Too bad I didn't see this post until now cause that holster looks like a cool thing! Oh well, I'll look for it at one of my favorite tool stores! I've put this on my "must have" list, there never seems to be enough room on the table for everything! !